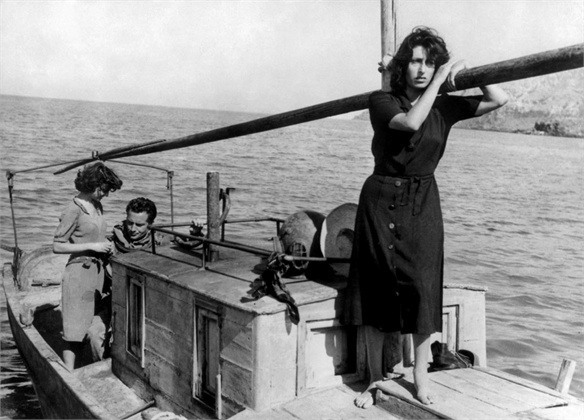 The movie Volcano (1950) represents a milestone for the Italian cinema of post Second World War: shot in the Aeolian islands, between Vulcano and Salina in the summer of 1949, it introduced the actress Anna Magnani, and was produced in response to Roberto Rossellini's movie " Stromboli land of God ". Rossellini had promised Anna Magnani the lead role in Stromboli Land of God but at the last minute, chose the Swedish actress Ingrid Bergman - with whom he had fallen in love. Anna Magnani, understandably resentful, started to film "Volcano". The movie was produced by Panaria Film, the historic label financed by a cultural tycoon protagonist of the industrial and economic development of Sicily, Prince Francesco Alliatas. It tells the story of Magdalene, a former prostitute who returns to her homeland but, avoided by all the inhabitants, finds herself in the company of her sister Maria - the only one who will take care of her. Magdalena will be the one to save her sister's life, who was a victim of violence by a diver. Magdalena will eventually sabotage his diving gear, during a dive. The former prostitute will tragically die during a volcanic eruption.